I read a blog post the other day commenting on the struggle to successfully market theatre productions by theatre some theatre makers in Cape Town. The solution to this problem would be to let theatre-makers make theatre, and let arts managers do the rest. In the Cape Town theatre industry, and this probably echoes worldwide, what theatre productions need, are arts managers. An arts manager is a company director, the person who runs the production like a business. An arts manager is not a producer who has input into the type of show the business must make. A producer might tend towards more commercial products and comprise the integrity of the artistic vision. An arts manager is a master problem-solver. An arts manager creates an environment for the artist to excel in, while putting all the business factors into place. This is not to say that a director is incapable of doing all of it himself, but with time escaping us all the time, the director is at risk of doing a half-arsed job, resulting in poorly thought out and a half-executed marketing campaign. The argument against having a someone else manage the business side of the work is that there is no budget for it. But then, is there ever budget for anything? Shows without budget operate on the currency of their network. Why should that network, which yields stage-managers, actors and writers hoping for a cut of the door, not also include a marketing manager / publicist who will only increase the number of bums on seats? It doesn’t matter if you are the worlds best theatre-maker if no one knows about you.. does it? A healthy relationship between the creative and the manager ensures that the directors vision is in tact and the excited audiences know what they’re in for. 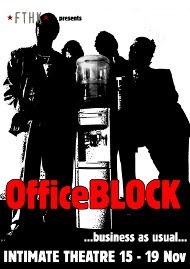 For FTH:K, Rob is the artistic director and is in the process of rehearsing OfficeBLOCK. Rob has been with the company for 6 years, and has done time as an arts manager. He understands what the job entails and so communicates his ideas with the company director, the publicist and online marketing manager who currently make up the arts management team. This frees the creative team, the director, actors, stage manager and designer to focus on the development of their project while the administration, funding and management of the brand is run by the arts management team. Conceptually, OfficeBLOCK is about “The beauty of invisible things” which fires off a whole stream of ideas from the depths of the imagination. But it doesn’t tell the audience enough about the show. At least not in relationship to the name of the piece. In a meeting between the creative team and the arts management team, “Business as Usual” was chosen as the catch phrase. The cutting edge, award-winning company known for it’s non-verbal visual theatre work with pieces such as Benchmarks, QUACK!, Pictures of You, and Womb Tide. at the Intimate Theatre this November 15th – 19th. Contact Angela at the Office for details. This post is part of what the company stands for in terms of arts management. Using our current show as an example is a way of educating and marketing our show. Rings back to the old sales ABC (Always Be Closing), always be talking about your show. It’s great that there are people out there who are tired of the poorly executed marketing campaigns out there, to them we raise our glasses, be it tequila, brandy and coke, or a cuppa tea and salute them. We, FTH:K join you in the the war against unprofessional approaches to theatre and celebrate the arrival of arts management.